"Thank you for coming to the White House...and especially for entertaining the children and their adult guests. Your engaging performance delighted everyone..."
Book James for your next event today! It's easy to book a fun magic show. Call 1-888-773-2155 or send info about your event via the contact form. "Thank you for coming to the White House...and especially for entertaining the children and their adult guests." "You really WOWED the audience at our American Airlines leadership conference last week. Your magic was an enormous hit." 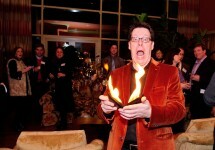 "Mr. Munton performed his magic at a company gathering of senior level executives and was the evening's highlight! To say he was a hit is an understatement!" "You were spot-on great. I had nothing but terrific feedback from every person I talked with afterward. You are a real pro!" "James had an enormous crowd gathered at our booth and played a major role in our company's presence at the conference." Hilarious comedy magic show is ideal after-dinner entertainment. Mingle Magic is the perfect treat for your guests. Make your next holiday party one to remember! Planning a party at your home? Add some magic...! You'll have the busiest booth at your next trade show when James Munton works his magic! Fantastic entertainment for your special day! Your colleagues will have a great time at your next office party. School shows and entertainment for the little ones. Affordable options to suit every occasion and budget!